This Intermediate Kayak Award (IKA) is a 5-day course delivered in a moving water environment (Grade 2). 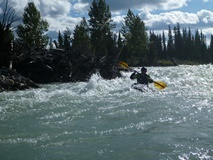 The course content includes clothing and equipment, access and conservation, river hazards and grading, weather, lifting, carrying and launching, efficient forward/reverse paddling, edging, and moving sideways, support strokes, breaking in/out, ferry gliding, group/self/deep water rescues, rolling and safety training. The outcome of this course is for the candidate to demonstrate personal competence in paddling grade 2-3 moving water as part of a led group. The British Canoeing White Water Award is incorporated into this course.